Storage utility pricing programs available from many vendors provide an OpEx option for on-premises that many customers appreciate. But because of the way most of these programs are structured, they often fail to match the service levels and flexibility of tier 1 cloud storage services. Also, the upcoming changes to the International Accounting Standards Board standards will, most likely, force the underlying assets back onto the balance sheet as capital equipment. 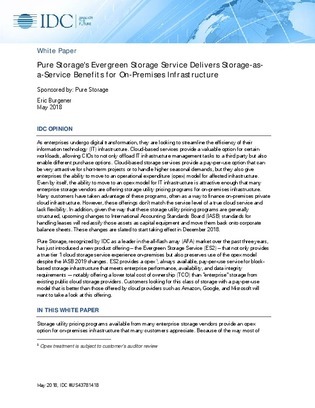 This IDC white paper discusses the impact of the forthcoming IASB changes on legacy storage utility pricing programs, and takes a close look at a new private cloud offering that not only will continue to provide an OpEx purchase option for on-premises infrastructure, but also can deliver the tier 1 storage-as-a-service experience. Read on for more.